A local BC author recently discovered a rare manuscript stowed in the archives at the Lake Cowichan Museum while doing research for an upcoming book. The manuscript was written by Lieutenant-Colonel Andrew Haggard, a famous Victorian author, who often visited the area on sporting trips, and eventually purchased an estate along the Cowichan River. I didn't recognize the title as it was and wondered whether it might be an unpublished work, but some quick digging revealed that this is likely the first draft manuscript of what would later become what is arguable his most famous title, Louis XIV and Antoinette. “I was keyed onto the subject of famous personages who'd once lived here by my good friend, Dustin Lebeaux, who explained that certain members of the Bram Stoker family had an estate here at one time, on the Youbou side. At first I was in disbelief. I began research on the subject and found that, in addition to the Stoker family, there were numerous writers and famous artists who travelled here, or set up shop in the Cowichan Valley during the 19th and early 20th centuries, attracted to the area by the majestic beauty here. Many of them touted the area as unequalled in the world - Rudyard Kipling was one of the Island's biggest advocates. These were bold assertions they were making. However, many of them were ex-military people, much decorated for campaigns in British-held territories from the 1850s onward. Others were diplomatic dignitaries who travelled for politics, rather than war. Any case, Vancouver Island fast became the rage back in the mother land, and many writers relocated to Victoria, and from there, further up-Island, seeking solitude and a place in the world from which to ply their craft. Among these were Rudyard Kipling, who was in Victoria for a time; Robert Service - who resided in Cowichan Bay, during his formative years in the early 1900s; the Stoker family; Frederick Whymper, the famous 19th century artist who was the hired to record visual impressions of the Vancouver Island Exploration Expedition in 1863, for posterity. There are many others who've come here over time. A little further this way time-wise, one of the Apollo 13 Mission astronauts, Edgar Mitchell, even spent several years of his childhood here in Lake Cowichan. According to Tony Green, present owner of Greendale Riverside Cabins - what was once the Haggard property, it was Norm Wood, an English teacher at the Lake Cowichan High School, who prompted Green senior to help him search the attic for any clues of Haggard's presence. 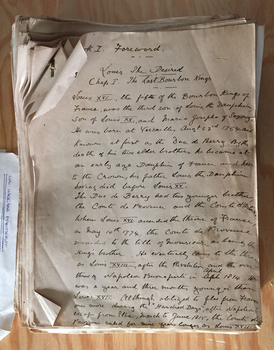 The manuscript was found and soon-after donated to the Lake Cowichan Museum. In her Blog, An Angler's Paradise ~ Sport fishing and Settler Society on Vancouver Island, 1860s-1920s, Diane Pedersen, points out that Andrew and his wife, Jeannette Ethel Fowler, owned the retirement property in Lake Cowichan from 1906 to 1919. In 1906 the two purchased the property on the Cowichan River, less than a mile from the Riverside Hotel, and christened their estate “Camp Haggard” - an epithet that suggests a wry wit beneath his serious writer's mind. The larger part of Haggard's canon of work comprised French histories, poetry, historical fiction, and roving accounts of his military exploits and sporting excursions. Through his fishing stories of angling on the wild and remote Cowichan River, he published in international sporting magazines and brought fame to the area's rich sport fishing. Later on, in 1914, Haggard was credited with saving the Cowichan River after he levied a state-of-the-nation statement titled, “Proposed act of violence” - essentially a letter-writing and publicity campaign through the auspices of the Victoria Times Colonist, and in strict opposition to a plan by the Vancouver Power and Land Company who intended to divert water to generate power. On March 11, 1914, Haggard's assertions to save the river were officially backed by Charles Lugrin, then editor of The Colonist. Both Haggard and Lugrin were ardent supporters of new environmental laws and thinking around sustainability and conservation that had then just begun. Pedersen points out that an earlier story in the Colonist, dated April 19, 1893, states that the Haggards were ensconced at the Riverside Hotel, where they intended to remain for the newly opened fly fish season. This was among some of the earliest references to the author carousing in the area, thus his love affair with the region was borne. On May 26, 1899, the Colonist again reported that the Haggards had once again taken rooms at the Riverside and were officially the first guests to stay there after a recent hotel renovation was completed.